These notes may be reposted, if reposted in full, source credited, link provided, and date of publication included. 2] The various ICD-11 Revision Topic Advisory Groups are developing the Beta draft on a separate, more complex platform accessible only to ICD-11 Revision. 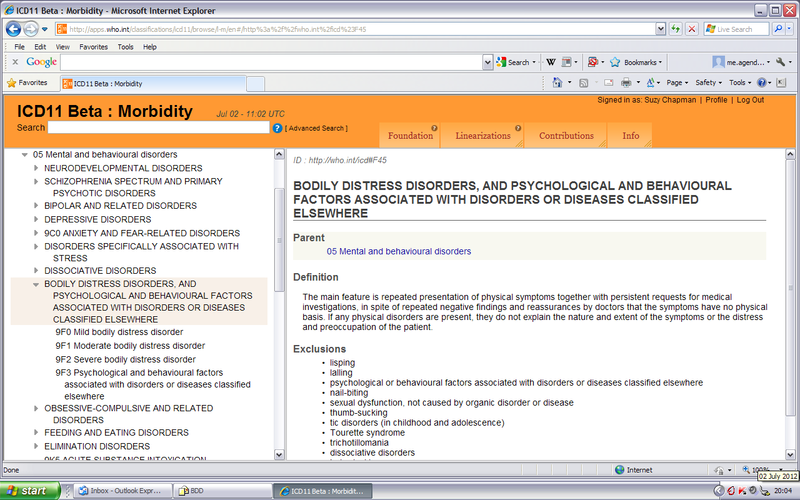 According to the public version of the ICD-11 Beta drafting platform, the existing ICD-10 Somatoform Disorders are currently proposed to be replaced with Bodily Distress Disorders, and Psychological and behavioural factors associated with disorders or diseases classified elsewhere, not with Bodily distress syndrome as Dr Garralda has in her slide presentation. There are no Definitions nor any other descriptors populated for the proposed, new ICD categories EC5 thru EC7. 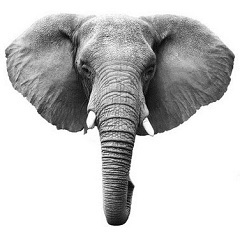 EC8 is a legacy category from ICD-10 and has some populated content imported from ICD-10. 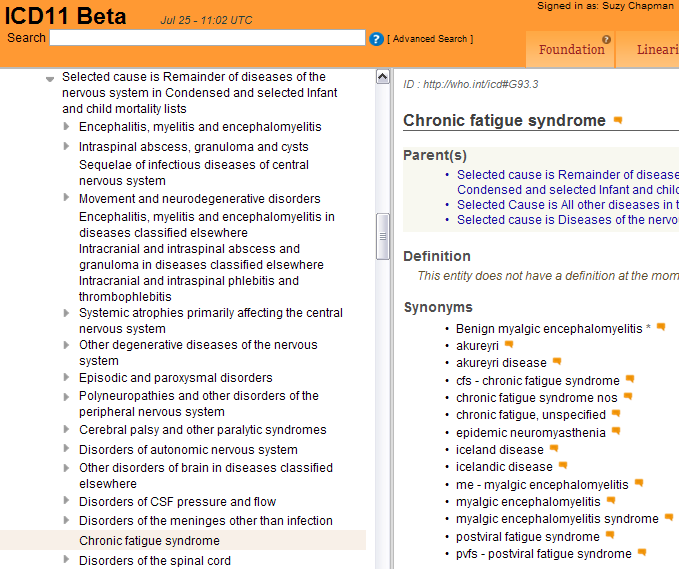 5] The existing ICD-10 Chapter V category Neurasthenia [ICD-10: F48.0] is no longer accounted for in the public version of the ICD-11 Beta draft. I have previously reported that for ICD-11-PHC, the Primary Care version of ICD-11, the proposal is to eliminate the term Neurasthenia. 6] I have previously reported that for ICD-11-PHC, the abridged, Primary Care version of ICD-11, the proposal, last year, was for a disorder section called Bodily distress disorders, under which would sit Bodily stress syndrome [sic]. 7] Dr Garralda lists Complex Somatic symptom disorder (DSM-V) on Slide 11 of her presentation. The manual texts for the next edition of DSM are in the process of being finalized for a projected release date of May 2013. The next edition of DSM will be published under the title DSM-5 not DSM-V . The intention is that once published, updates and revisions to DSM-5 will be styled: DSM-5.1, DSM-5.2 etc. When the third draft of DSM-5 was released in May 2012, the proposal was to merge Complex Somatic Symptom Disorder with Simple Somatic Symptom Disorder and to call this hybrid category Somatic Symptom Disorder. This would mean that this new disorder has the same name as the overall disorder section it sits under, which replaces DSM-IV’s Somatoform Disorders. As any subsequent changes to draft criteria sets following closure of the third stakeholder review are embargoed, I cannot confirm whether the SSD Work Group has decided to rename this category to Somatic symptom Disorder or retain the original term, Complex Somatic Symptom Disorder, the term used by Dr Garralda in her presentation. Documentation from the ICD-11 iCAT Alpha draft dating from May 2010, implies that the intention for ICD-11 is a change of hierarchy for the existing ICD-10 Title term Postviral fatigue syndrome. 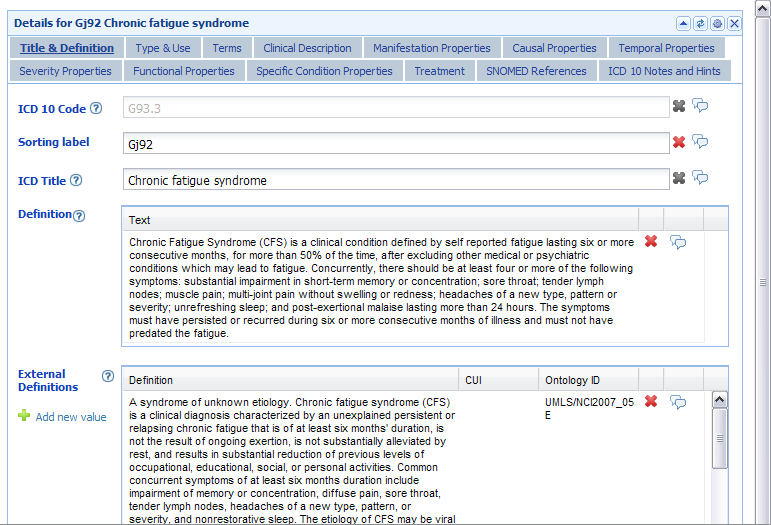 In the ICD-11 Beta draft, Chronic fatigue syndrome (which was listed only within the Index volume of ICD-10 and not listed in Volume 2: The Tabular List) appears to be elevated to ICD Title term status, with potentially up to 12 descriptive parameters yet to be completed and populated in accordance with the ICD-11 “Content Model”. But the current proposed hierarchical relationship between PVFS and CFS for ICD-11 remains unconfirmed. 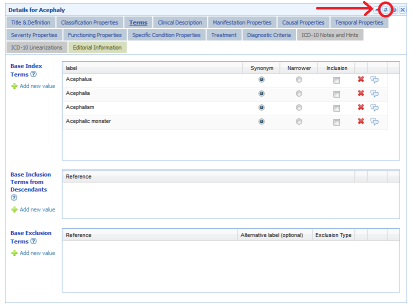 There is no discrete ICD Title term displaying for Postviral fatigue syndrome in either the ICD-11 Beta Foundation View or Linearization View. 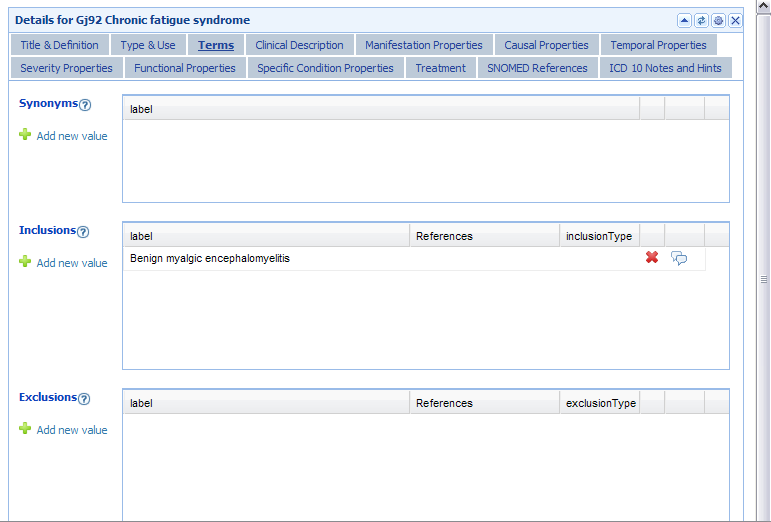 Neither is there any discrete ICD Title term displaying for Benign myalgic encephalomyelitis in either the Foundation View or Linearization View. 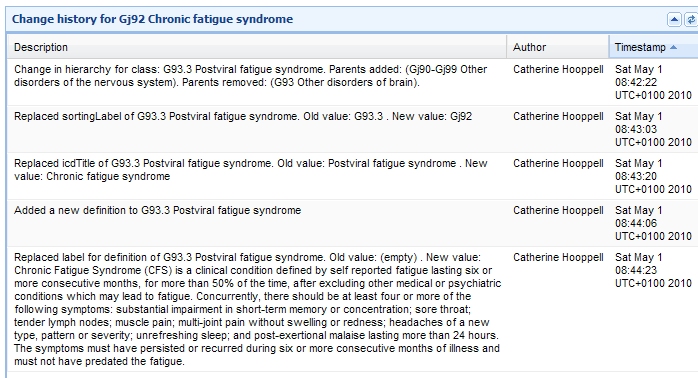 Postviral fatigue syndrome is also listed under “Synonyms” along with a number of other terms imported from other classification systems. Included in this list under “Synonyms” are “chronic fatigue syndrome nos” and “chronic fatigue, unspecified,” both of which appear to have been sourced from the as yet to be implemented, US specific, ICD-10-CM. 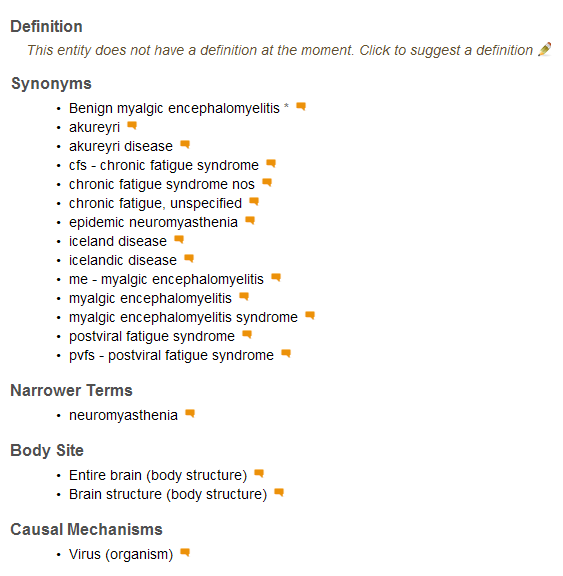 There are no Definition fields for Benign myalgic encephalomyelitis or Postviral fatigue syndrome as these terms are listed under “Synonyms” to ICD-11 Title term, Chronic fatigue syndrome. Since one needs to be mindful of the ICD-11 Caveats and as the Chair of Topic Advisory Group for Neurology has failed to respond to a request for clarification of the intention for these three terms and the proposed ICD relationships between them, I am not prepared to draw any conclusions from what can currently be seen in the Beta drafting platform. I shall continue to monitor the Beta draft and report on any significant changes.